I started making pie last fall because of Whole Foods, specifically because of a chocolate pecan pie Houston-area Whole Foods stores carried in the early 2000s around the holiday season. The choir director at my family's church used to buy these pies for the choir, to which my mother belonged. Because pecan pie was not part of my Swiss mother’s baking repertoire, this was my first pecan pie experience. I loved it. From then on, every time I ate regular pecan pie, I thought about the chocolate chips and striping on that store-bought pie. “I should learn to make that,” I thought. Every year, the motivation disappeared almost as quickly as my dessert, only to return at the sight of the next chocolate-free pecan pie. Last year, away on our fairytale fellowship year in snow-buried Boston, I warmed the kitchen with lots of baked goods. Three-layer chocolate cakes, king cake, coconut cake, carrot cake, pear crostata, chocolate-chip cookies, hazelnut-Nutella cookies, plum tortes, profiteroles, and lots of chocolate mousse (not baked, but awesome)… it was a lot. But no pie. One afternoon, two three-layer, frosted chocolate cakes. I will not do this again. Then we moved to D.C., where I got a job in a library, where one day, I spotted The Hoosier Mama Book of Pie waiting to be re-shelved. I flipped through it and found a recipe for a chocolate maple pecan pie. Its name was "Jeffersonville Pie.” Jeffersonville, Indiana is across the Ohio River from Louisville. I took this as a sign that I needed to not only make this pie, but also master pie-making. I borrowed the book from the library, read and reread the steps to flaky pie crust, then made my first chocolate maple pecan pie. It was a mess — the chocolate striping was more splat than stripe, and holes in the crust led to filling leakage. It was still delicious, because the leaked filling caramelized, and more chocolate is rarely a bad thing. I used the leftover pie dough to make a quiche. Then I tried the pecan pie again. It looked nice enough to take it to Thanksgiving dinner. 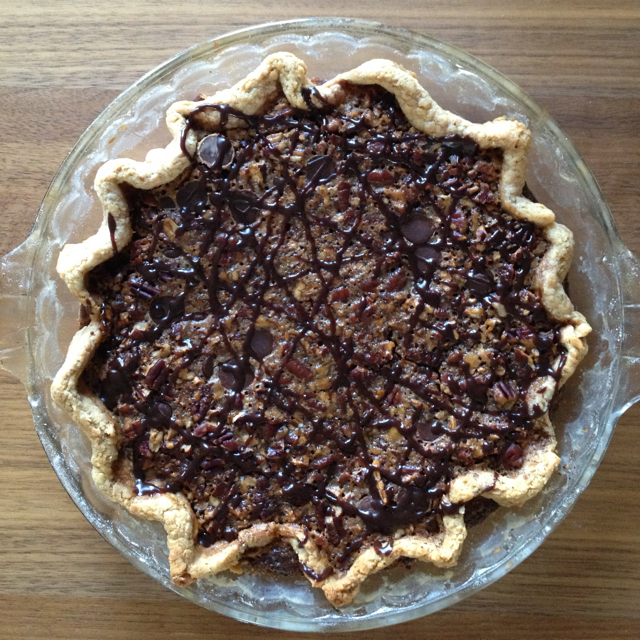 Chocolate maple pecan pie, attempt number two -- Thanksgiving dinner-worthy. Between borrowing the first pie book and Thanksgiving, my baking books somehow quadrupled. After accomplishing a decent-looking pie, I returned my books to the library and took a break from pie. In retrospect, I spent that break baking Christmas cookies and profiteroles and thinking about how I wanted to make the salty honey pie recipe from the Four & Twenty Blackbirds Pie Book. It took me almost a month to get to that recipe. The lovely thing about pie is you can make one in steps and spread it out over several days. I divided butter at the end of December, made the actual pie dough a week later, and a week after that, finally made the pie. I interpret the instruction to put something in the freezer for 30 minutes but preferably overnight to mean “put it in the freezer for as long as you need.” It's worked so far. Yesterday, I made another Blackbirds recipe — the Black Bottom Oatmeal Pie, which comes recommended as a substitute for a chocolate pecan pie. It’s oats and pecan pie ingredients on top of chocolate ganache. After a mishap with the ganache (added a cup too much heavy cream and made drinking chocolate instead of ganache), it turned out well. I won't be invited onto the Great British Baking Show anytime soon, but I'm no longer threatening to toss the pie crust before it makes it to the pan. I’ve been using the “basic flaky pie crust” recipe from Rose Levy Beranbaum’s Pie and Pastry Bible. If you decide you too need to master pie, I recommend first reading the Hoosier Mama’s prep instructions. They go step-by-step, and the book includes pictures of everything from rolling out the dough to crimping, where Beranbaum jumps around in a way I find confusing. That said, I prefer Beranbaum's crust recipe. I’m slowly getting better at pie crust and look forward to one day rolling out a circle of dough instead of a weird blob. I’m going to try Beranbaum’s Honeycomb Chiffon Pie next, complete with the honeybee decoration. I anticipate another mess, but the messes are still tasty. Do you have a favorite pie recipe or book? Tips on rolling out circular pie crusts?